The Fraser Institute’s 30th anniversary a good time to review its financing, influence. Aspiring reporters are taught in journalism school to “follow the money” when doing business or government stories. Who’s financing the project? Who will benefit from the rezoning or tax break? Who will lose out? This year the Fraser Institute celebrates its 30th anniversary. A gala was held in Calgary two weeks ago attended by 1200 well-fed libertarians, conservatives and reactionaries. Only two numbers were mentioned in the news coverage: 30 and 1200. Missing in action was the more important number, 100 million: the dollars, more or less, that have been funnelled through the institute over the years. Early on executive director Michael Walker had to scramble to meet his payroll of $100,000. Last year he brought in $6.6 million, the largest amount in its history, vaulting it past some of its sister propaganda outfits in the U.S. When averaged, the grand total is about $100 million – about half of the missing money in the Liberal government sponsorship scandal. Forgetting what their journalism profs told them, reporters never asked who’s pouring that much money into the think tank, and why? True, it isn’t easy to answer this question unless Walker divulges the information, and for once, he’s not talking. Canadian law for tax-exempt societies does not require contributors to be made public. The Institute’s annual report provides a breakdown by category of donor: 52% from foundations, 38% from organizations and the remainder from individuals. Tax-exempt foundations must list recipients of their grants, so it is possible to identify most of this foundation money. Four large Canadian foundations provide the lion’s share of nearly $3.5 million from this source. Until recently, the leader was the Donner Canadian Foundation, a key organization in the project to change the ideological fabric of Canadian society. It is known as paymaster to the right and it’s safe to say that the reactionary right would have made little headway in Canada in the past decade without Donner’s backing. Stephen Harper would be a nobody, for instance. Donner has assets of $200 million and gives out two million a year to right-wing causes. In the mid-90s, it established three new libertarian think tanks, the Atlantic Institute for Market Studies in Halifax, the Frontier Centre for Public Policy in Winnipeg and the Montreal Economic Institute. Donner also gave $100,000 to start CanStats, a Fraser Institute division that purports to monitor how the media report science and statistics. Most of the work is done by ideologues who are neither scientists nor statisticians. Noam Chomsky and Ed Herman call this activity ‘flak’. By criticizing and harassing mainstream media, flak organizations can pull media reporting to the right. 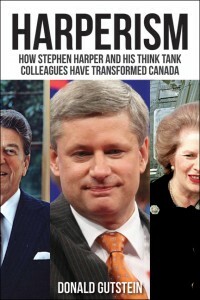 By the late 1990s, right-wing Canadian foundations were exhibiting the same coordinated funding behaviour that made the American foundations so formidable. This dangerous development occurred after Michael Walker joined the board of Calgary-based Max Bell Foundation in 1996. (He left in 2003. ) Along with Donner, Bell began providing large sums for school choice projects which are designed to destabilize public education, including $500,000 to the Fraser Institute and similar amounts for charter schools in Alberta. Max Bell also provides money for an intern to marshal the evidence in favour of for-profit health care. Walker reined in two more foundations to support the school choice work, the Lotte and John Hecht Memorial Foundation, whose money came from selling arms, and the W Garfield Weston Foundation, whose money comes from a less colourful source – selling biscuits. Galen Weston – Canada’s second wealthiest person – and his family are becoming the most important funding source. They have committed over $10 million on the institute’s school vouchers program. Corporate contributions are buried in the institute’s accounts. It’s been 20 years since Walker released a list of corporate members. But a look at the board of trustees reveals some interesting patterns. There’s a representative from Pfizer, the world’s largest multinational drug company. Just coincidentally, since Walker claims no trustee can tell the staff what to do, the Fraser has a pharmaceutical policy division which attacks internet pharmacies that provide cheaper drugs for Americans, disparages critics of drug company policies regarding distribution of HIV/AIDs drugs in Africa, attacks generic drugs and opposes the ban on direct-to-consumer advertising of prescription drugs, all of benefit to Pfizer. There’s big and small oil and gas money from Calgary (Gwyn Morgan of EnCana, R J Pirie of Sabre Energy). Just coincidentally the Fraser has supported so-called climate change skeptics for nearly a decade. There are investors from Vancouver (Peter Brown of Cannacord Capital) and Toronto (James McGovern of Arrow Hedge Partners who manages $300 million in hedge funds for high net worth individuals). Just coincidentally, cutting corporate and income taxes has been a Fraser mainstay. If the media don’t tell the story, Canadians won’t know about the Fraser’s reactionary agenda. It’s not obvious why the CBC’s coverage of the gala was so uncritical and boosterish. Perhaps the public broadcaster is cowed by decades of anti-CBC flak generated by the institute. CanWest Global’s slavish coverage is more understandable. David Asper is no longer a trustee. He resigned when he became publisher of the National Post. But the Calgary Herald was a sponsor of the event and former Fraser Institute intern Danielle Smith, a Herald editorial writer and now host of Aspers’ Global Sunday, emceed the evening. The Ottawa Citizen editorialized that the Fraser Institute is a dissenting hero standing up to the socialist establishment. Another interpretation is that the Fraser is a small cog in a global wheel of reaction designed to roll back the democratic gains of the twentieth century. Hundreds of millions of corporate and foundation dollars make the wheel go round. First published in Straight Goods.ca.